The irony of Christopher Alden's new production of A Midsummer Night's Dream is that in reading it as personal to its composer Benjamin Britten, he also takes it away from what the composer's own ideas about the piece must have been. For this is not The Dream but A Midsummer's Nightmare, based on Britten's experiences at school and his lifelong attraction to young boys. On the eve of his wedding, a man returns to his school and dreams about his time there. The chorus of fairies are all dressed as schoolboys, and Bottom and his rustic cronies are the school's staff. Everyone's smoking a joint, instead of taking a magic potion, and all the magic is a hallucination. The comedy is mostly gone, and we're left with a gloomy depiction of life in a boy's boarding school at roughly the time Britten was a schoolboy. I'm sure some people will love this concept, which is carried through extensively and relentlessly, and it's not for me to condemn it. But the shift in setting does not connect with the ethereal quality of the music and the otherness of the story for me. Whether or not Britten had lurid thoughts about the boys in the original production, or how he felt about his own schooldays, is neither here nor there. To read the opera as a piece of narrow autobiography is such a cliché by now, and not an accurate one. Britten was many things, and an intelligent and imaginative reader of literature was one of them. He even attempted an operatic setting of The Tempest, Shakespeare's play about music. And here, in The Dream, he's experimenting with creating specific, separate soundworlds for the lovers, the fairies and the rustics. 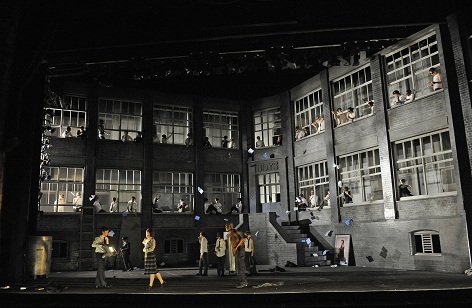 By presenting almost the whole opera in a single setting – a grey, gloomy courtyard, modified only for the play in the final act – you get little of this contrast and none of the subtleties of Shakespeare's text, which are still there even in Britten's cut-down version. The pastoral and the magical were nowhere to be seen, and once Alden's point had been made, the production went nowhere for me. Thankfully, ENO has assembled a very decent cast. It was deeply unfortunate that Iestyn Davies was too ill to sing the role of Oberon, but we were lucky that William Towers (currently rehearsing at Glyndebourne) was available to step into the breach. Both gave an excellent performance: Davies threw himself into the part in spite of feeling ill, and Towers was confident and nuanced throughout, thoroughly deserving the ovation at the curtain call. Still, you can't beat experience, and for me by far and away the stand-out performance came from Willard White as Bottom. His way with the text, his commitment and the beauty of sound all combine to create a complete experience. Indeed, the rustics in general were all very fine; Jonathan Veira's Quince and Graeme Danby's Flute were particularly excellent. I was disappointed by the women – Anna Christy's thin-voiced Tytania, Kate Valentine's Helena and Catherine Young's Hippolyta were all dramatically engaged but vocally underwhelming – but Benedict Nelson's Demetrius and Allan Clayton's Lysander (in spite of an announced indisposition) rose to the occasion on all fronts. The sparseness of the staging was reflected in a musical reading that also lacked colour, perhaps deliberately. Leo Hussain seemed to stretch every dissonance and clash to breaking point, in order to make the soundworld appear to reflect a setting of perverse eeriness, rather than wonder. The result was dull and cliched, for me at least, and although the final act proved more entertaining and interesting, all the tricks of fire and shadowy lighting failed to make this the Dream many of us might have hoped for.